A video depicting a police officer’s physical altercation with a fan has caused a stir on social media. Police are now investigating the incident where a female University of Miami football fan who appears intoxicated, slaps an officer, who retaliates by punching her in the head. Bridget Freitas, a 30-year-old nurse has been charged with felony battery on a police officer and a misdemeanor disorderly conduct, NBC affiliate KARE11 reported. 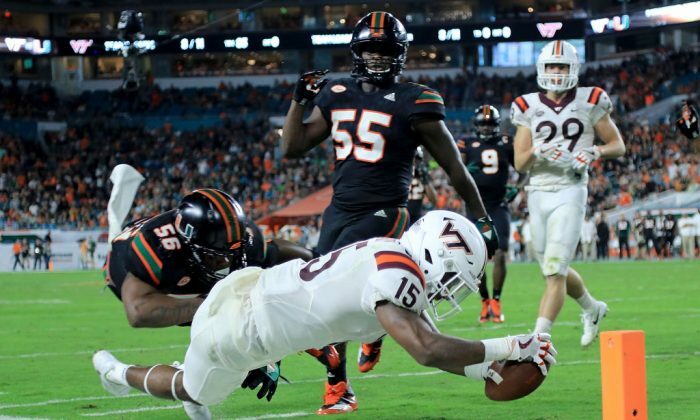 Miami-Dade Police Detective Alvaro Zabaleta said that the department is currently viewing the video to make sure the proper procedures were followed in the incident that took place at the Hard Rock Stadium, during Miami’s win Saturday over Virginia Tech. Earlier, Freitas had been arguing with other fans and was “using profanity in a loud, boisterous manner” when officers arrived at the scene. Officers said they tried to calm her down and asked her to move to the concourse but she refused and sat on the steps according to an arrest report obtained by KARE11. Miami-Dade police said in a statement on Twitter that their “primary concern” was to promote a safe environment. “Supervisory personnel are aware of the video and are reviewing the incident to ensure compliance with our policies and procedures” the statement continued. The short 14-second video posted on Twitter shows four officers picking up Freitas to remove her from the area. She can be seen donning a green and orange Miami jersey. Freitas flails her arms as the officers carry her, the footage shows her eyes were half closed. She then flails with her open hand at one officer who was carrying her right leg and misses, but then she hits him the in the face with her backhand slap. The officer immediately reacts, hitting her with force directly on the head with his right fist. As of writing on Monday, Nov. 6, police have not released the officer’s full name. According to CBS Miami, the officer that struck Freitas is identified only as Detective Ross. The video has spurred headlines across the internet. According to KARE11 jail records do not show Freitas being held on Sunday afternoon. Officials from the University of Miami also said they were aware of the video and were investigating the incident. KARE11 reported that the school often employs off-duty officers in uniform to assist with crowd control, traffic, and security at football games. There were many other altercations in the stands on Saturday that required the intervention of law enforcement.